Hormex offers a choice of five hormone-based Â?HormogenizedÂ?Â? Rooting Powders. 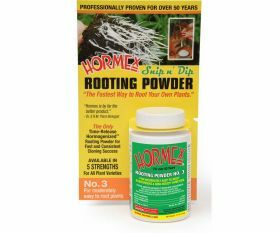 After 50 years itÂ?s still the finest root producing powder and the only rooting powders to offer 5 strengths for every rooting variety and propagating condition. Snip'n Dip #3 is intended for woody and semi-woody plants including evergreens. Recommended for Arbor-vitae, Azalea Dauricum, Azalea Mollis, Blueberry, Daphne, Elder, Ivy, Pyracantha, Juniperus Chinensis Pfitzeriana, Juniperus Sabina Fastigiata, Sequoia Gigantea, Roses.